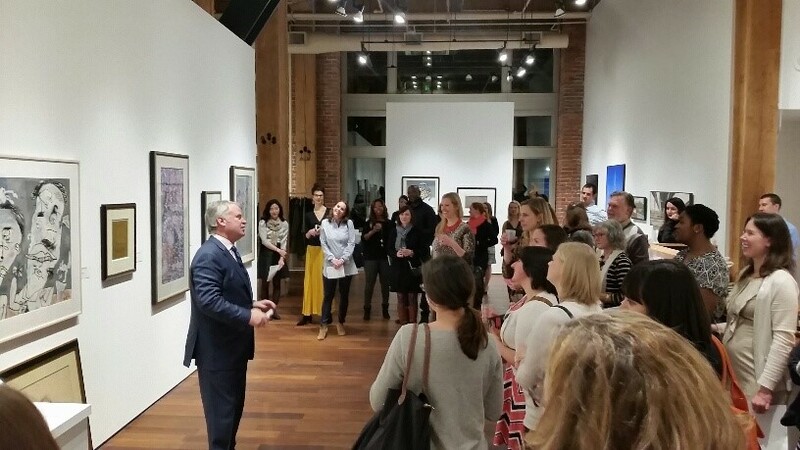 Last month, a few dozen Junior League of Seattle members, along with several guests, congregated at the Woodside / Braseth Gallery for an evening of art and conversation focused on northwest art and artists. John Braseth, the owner, warmly welcomed visitors and led a tour of the beautiful space. Jessica, Meredith and Katharine, JLS members, left this event feeling inspired and eager to share their thoughts about art. I would consider myself to be someone who appreciates fine art, but most certainly not an expert or collector. 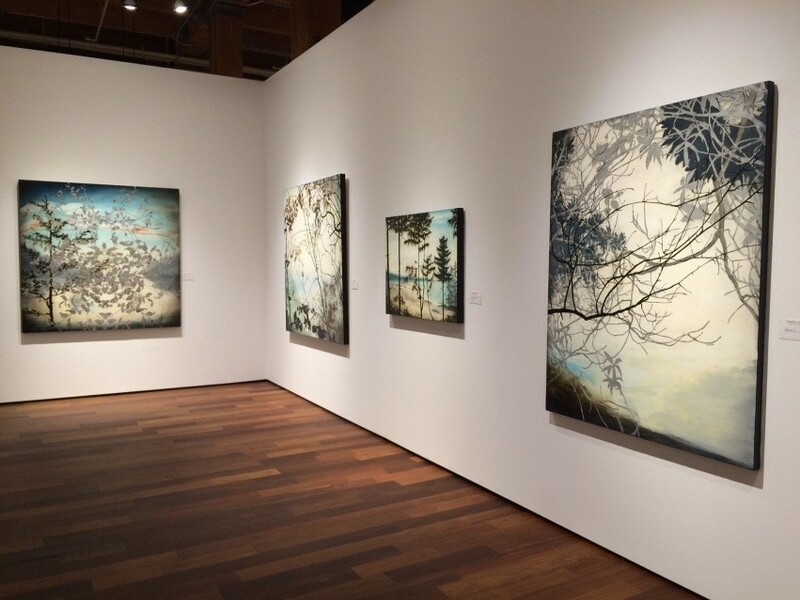 As we walked through the current Jared Rue exhibit, and stopped to learn about the other Northwest artists also on display, John touched upon a topic that had recently crossed my mind: how does one begin an art collection? I have been fortunate enough to see renowned pieces in museums, galleries, and even private homes. However, the idea of purchasing a piece of “real” art–meaning, a bigger investment than custom framing on a print that I bought from a One Kings Lane sale–has always seemed a bit intimidating. Original artwork can be very expensive, and what do I know about investing in art, anyway? However, John emphasized that collecting can really begin anywhere–and that a personal attachment to the artist’s work is the most important element. Building a collection goes beyond whether or not something matches your home decor. It’s about the emotional ties that a buyer feels about the piece, and patronage of an artist can start small. While this all seems pretty obvious as I type it out, I realized that I’d attributed too much importance to the notion that art collecting needs to be done in a certain way–which inherently made starting a collection seem daunting and prohibitively expensive. While I didn’t walk out of the Woodside / Braseth Gallery with a painting in hand, the evening inspired me to further explore the amazing art of the Pacific Northwest–and made me hopeful about eventually bring an original piece into my home. How do you feel when you look at the artwork? What do you think the artist was feeling when (s) he made this piece? Ultimately, the docents are encouraging the classroom to explore and discover the art and the artist. Very rarely, will students state that they love or hate the art work. They manage to be open- minded and very honest about what they see. Part of me wonders if their open mindedness is because they aren’t thinking about the art as something they would or wouldn’t own. They are just seeing it and appreciating the art for exactly what it is: Art. Spending the evening with NW Art at the Woodside/Braseth Gallery was lovely. And listening to John Braseth talk about the history of the gallery and his experience with art, art patrons, and artists, was fascinating. But I couldn’t help but miss the excitement of the classroom. Maybe we are all ladies now, and a bit too refined to shoot up our hands or shout out what the paintings make us feel. Maybe we are scared that we’ll get it wrong. What if I don’t like the painting but the person next to me loves it? Or we worry about buying the perfect piece of art. I’m realizing that we, as adults, are missing out on what the Northwest Art docents are encouraging classrooms to do: Explore and discover the art and the artist. Very rarely will you walk into a gallery or museum where someone will prompt you with questions about the art. We need to train ourselves to ask the questions and really see the art. We need to be curious and explorative and seek out the art of discovery. Love the piece or don’t love the piece, but still appreciate the art. As someone who has grown up as a daughter of an artist and has been experiencing life through art for 30+ years, I am always fascinated by learning how other people’s lives have been changed by art. I majored in Art History in college but left school feeling that “art” had a different meaning to everyone. We can analyze a piece to death and know all about the time in which it was created and what the artist was thinking, but none of that really matters if you hate the piece or feel nothing when you see it. What I appreciated most about the NW Art Training at the Woodside/Braseth Gallery was listening to the owner, John, speak about one piece in particular that made him realize how art can create a physical reaction. This is Morris Graves’ “The Wounded Gull” created in 1943. Graves created the painting during WW2 to communicate the darkness of war. John said that he first saw “The Wounded Gull” as a very young man, and it was the first time in his life that he realized art didn’t have to be pretty in order to make you feel something. He commented that it is not necessarily the type of piece that everyone wants to have in their living room, but it is something that makes you think or even better, it is something that makes you feel. I think that many people see art as a way to decorate. That is a completely natural response. But when you first experience having an emotional or visceral reaction to a piece of art, you are forever changed and never look at art the same way. I am so thankful to have been able to see a little bit of what the NW Art program is all about. Spreading the appreciation of original creative works to people who would not normally get to experience it, is a huge task and one that massively impacts a community of growing minds. John’s call to action is what I left with in my mind. Do not be afraid to look at all types of art. Ask yourself if you have a reaction to a piece. And then, support an artist. An art collection can start with a $25 screen print that you purchased from an artist at a First Thursday art walk. It doesn’t have to be the price of a car. Just get out and experience art. A cornerstone of Junior League of Seattle is the many diverse training opportunities for its members. The NW Art Evening of Conversation is just one unique example. The League also offers trainings in everything from legislative advocacy, to running effective business meetings, to living a balanced life. If you are interested in joining the Junior League of Seattle, please read more on the JLS website about the upcoming Meet & Greets for prospective members. The Junior League of Seattle is an organization of nearly 1,300 women who are committed to promoting voluntarism and to improving the community through the effective action and leadership of trained volunteers. Membership in the Junior League of Seattle is divided into 3 levels of membership status: Provisional, Active and Sustainer. Provisional status is reserved for members in their first year of membership, which is dedicated to training. Provisional status is followed by Active membership, then Sustainer status. What provisional group are you in? I am in the Panteleoni Provisional group! Most of our group lives in West Seattle: I am one of the outliers residing near Columbia City. What is your provisional project? I chose to go with Northwest Art. I have always been interested in learning about art and the motivations behind certain pieces. I was lucky enough to take art classes all through elementary and junior high school and then to go on to Studio Art in high school. My art teachers were the most inspiring teachers I had growing up, and I can’t imagine missing out on that kind of instruction like some of the kids in this city do. I am excited to get started on the project this spring! What prompted you to join the Junior League this year? I had looked in to different volunteer opportunities when I first moved to the area, but it seemed difficult to get an “in” just as an individual. When I looked into Junior League in Seattle it seemed like the organization provided a lot of structure and contacts within the community that would allow me to volunteer in a variety of roles. Also, as a recent college graduate and transplant from Texas, I missed the group of female friends I met as a member of a service sorority. I wanted to find a group of like-minded women in my new home, and the League seemed like a good place to start. How did you first hear about the Junior League? I first heard about Junior League growing up from my grandma when she used a life-changing sourdough bread recipe from the chapter cookbook in Wichita Falls, TX. I looked in to actually joining last year when one of my sorority sisters joined the League in Houston and raved about how much fun she was having. What are you most excited about for the 2014-2015 year? What most interests you about the Junior League? I love that the Junior League has such a strong and important history nationally and in Seattle, especially in regards to service to women and children. It feels very cool to be a part of such a network of impressive women and to have the opportunity to continue service to this community that has been happening for over 90 years. I have been up here for a year and a half. What is your favorite Seattle restaurant? That’s a hard question in a city like Seattle. I love Intermezzo Carmine in Pioneer Square for a fancy date night with nice cocktails, but if I’m really hungry I go for the movie-themed sandwiches and the drink specials at HoneyHole in Capitol Hill. What is your favorite touristy thing to do in Seattle? I love going to the market, but especially so when the weather is really bad so that there isn’t such a crowd. I am always up for a Piroshky and tea samples from Market Spice! What has surprised you the most about the Junior League? It was surprising that there are so many women who are new to Seattle like I am. I expected JL to be full of native Seattleites. Membership in the Junior League of Seattle is open to women ages 18 and older who express an interest in voluntarism. If you are interested in becoming a member, join us for a Meet & Greet this spring. Send an email to newmemberinfo@jrleagueseattle.org to find out the orientation schedule. This is the story of how and why 250,000 children learned to understand and appreciate the visual arts through the Northwest Art Project, the longest lasting project of the Junior League of Seattle. In the late fifties Sputnik went up and the boom came down on public education, bringing in intense focus on improving math and science skills but also, in the process, cutting budgets in the arts. In fact it seems that since then whenever public school budgets are cut, the arts are the first to go. Yet in every culture since the beginning of human history, the arts have been essential parts of daily life, decorating cave walls and early tools and utensils. The arts have been the high point of every civilization. Furthermore, they have always been essential components of the finest educational systems, not just because they have cultural value, but also because they are languages that all people speak. Fifty years ago the Junior League’s Community Arts Committee was concerned about the lack of arts education in public schools and created the Northwest Art Project to restore some of what was being lost. School halls were often dingy and on the walls were only faded reproductions here and there. Dee Dickinson, chair of the committee at that time, was aware that the Northwest was an unusually rich source of visual art by local artists who were already gaining worldwide acclaim. She was also painfully aware that there were many children who had never seen an original work of art and had never visited an art museum. There was as, a result, a real void in their education that might be filled by learning to understand and appreciate artistry and have opportunities to do creative work of their own through the guidance of trained docents. Dee first approached Dr. Richard Fuller, who was at that time the director of the Seattle Art Museum, then located in Volunteer Park. He had never had children of his own, and when he heard about the proposed project he was not pleased with the idea of bringing original works of art into the schools. He also did not appreciate what the project might do to enhance children’s understanding and appreciation of the visual arts, inspiration, and imagination, as well as leading to their becoming future museum-goers. She next approached Kenneth Callahan, who was wildly enthusiastic about the proposed project. He said, “Come with me.” They went upstairs to a guest room, and he pulled out from under the bed two magnificent paintings that he said he had been saving for a major museum collection. He said, “Take your pick. Let the children come close to see it well. Let them touch it and feel it and smell it. If it gets dirty bring it back to me and I’ll clean it off with a raw potato. Encourage them to look at it carefully and tell what they think it means! !” That visit launched the project, and Callahan’s magnificent painting, “Crystalline World,” led it off. A small jury was created composed of professional art experts including Junior League member Virginia Wright, a well-known collector of art. They counseled the committee on which artists to add and they next approached Guy Anderson, Paul Horiuchi, George Tsutakawa, James Washington Jr., Spencer Moseley, and Glen Alps. Later, through a Junior League grant, paintings by Mark Tobey and Morris Graves were added, and a painting by Helmi Juvonen was acquired by sending art materials to the hospital where she was a patient. The project was planned to be taken into the schools by Junior League docents who were trained in how to make their visits interactive, not just informational, and a number of different trainers, artists, and visits to studios have been involved over the years. As a result the docents have helped children to see with fresh eyes, looking for hidden meanings, appreciating the colors and designs, leaning about the use of different media, responding with their own views of the artworks, and being inspired to create some works of their own. The visits often become multisensory experiences as children imagine walking into a painting, hearing, feeling, or smelling what it is like inside. At times music is used to blend with the rhythms of a painting, or children are asked to make sounds like those of the animals pictured, or to give a work of art a title of their own, or write a short story or poem in response to what they see. The works of art are left at the schools for several weeks so that further exploration and inspiration may occur. Initially, the League docents received their training at the Seattle Art Museum, and later at the Henry Art Gallery on the University of Washington campus where they learned about art principles and studied art history. The artworks in the League’s collection were kept at the Henry Gallery when they were not in use in the schools. At that time, the docents themselves would take some of the artworks to the different schools in their own cars. As the collection grew, however, crates were built and storage and transportation were arranged. Later on the trainings and storage moved to the League office in Madison Park. As the collection continued to expand, more space and controlled temperature in the environment were required, so the artworks were transferred to Artech which now cares for them when they are not traveling. In 1994, a relationship began with the Bellevue Arts Museum, and during that time the Junior League docents offered training on how to present the artworks interactively to teachers and PTA parents on the Eastside. This connection has extended the reach of the project. Also, since 2001, a professional art education consultant, Halinka Wodzicki, has helped enlarge the scope of the docent training. She has written extended learning activity packets that are given to the teachers to help them connect the children’s art experiences to their curriculums. During the last 50 years, over 500 Junior League docents have been part of the project that has reached over 250,000 children in around 600 schools in King County. 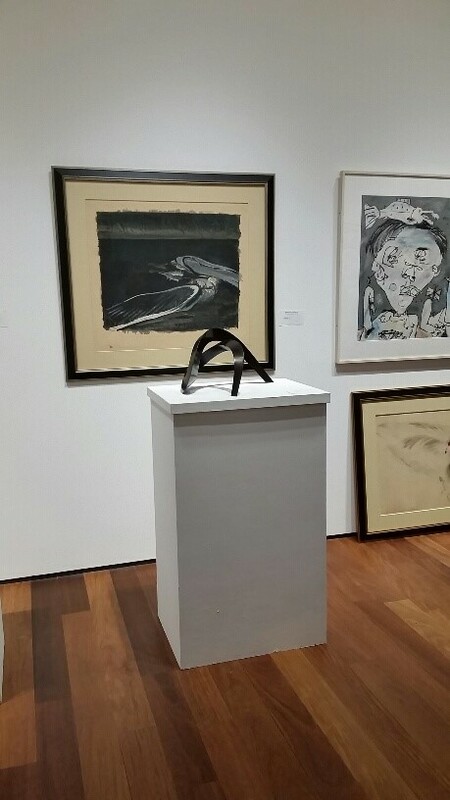 In 2004, the Northwest Art Project was displayed at Harborview Medical Center; however, in 2010, the entire collection, which now includes 75 works of art, was displayed for the first time in a museum setting at the Bellevue Arts Museum. Docents have reported numerous rewarding results of their visits to the schools. During one visit, an autistic child who had never before spoken in class talked eagerly about a painting he had fallen in love with and after that he continued to participate more frequently in class discussions. One student was fascinated by Jack Chevalier’s mixed-media piece, “Lighthouse,” and said she would like to have it for her own because it would help her with her math. In another class one of the students was so inspired that he continued working on his own painting and missed lunch in the process. In an English as a Second Language class, a docent asked the children what they thought the people were anticipating in Joe Max Emminger’s “Two People Waiting.” One student answered “Freedom” which led to a rich discussion of expectations and experiences one has in coming to a new country. Children are so often stimulated that they are still anxious to give their interpretations of the art when the period ends. Children’s eager participation, thoughtful interpretations, artworks, poems, stories, dances, and dramatizations continue to surprise not only the docents but also the children’s own teachers. Now in its 51st year, the Junior League’s Northwest Art Project includes not only paintings and drawings but also collages, sculptures, glass art, and carvings. It continues to meet the needs that motivated its inception. Public schools still face budget cuts in the arts, and there are often fewer opportunities to develop higher order thinking skills, applied learning, and seeing projects through from beginning to end. These skills are in great demand today as any kind of employment and even daily living require more creative thinking and problem-solving abilities. Recent studies (as reported in the media such as the July17, 2010 issue of Newsweek) have shown that creativity has been declining in our country at the same time as creative thinking is being emphasized in the schools and is rising in the workplaces of other countries. Even the U.S. Patent Office is concerned. Another current need in education, as diversity increases in school populations, is for a greater variety of teaching and learning styles that teachers often learn through observing the docents’ visits. Many teachers are able to integrate what they have observed into other parts of the curriculum as well, resulting in their students’ greater understanding and ability to apply what they have learned. The Northwest Art Project continues to seek ways to fill some of today’s needs as well as those in the years ahead to help in the development of “whole” human beings, mentally, physically, and emotionally. November 2010, the Junior League of Seattle proudly debuted its newest publication, The Art of Discovery. This book is colorful, engaging and instructive whose purpose is to educate, stimulate and inspire young minds through vivid images of art created by significant artists represented in the Junior League of Seattle’s Northwest Art Project and provides the volunteer-based community program with an on-going fundraiser in which profits from the sale of the book will be returned to the community through funding of the Northwest Art Project.